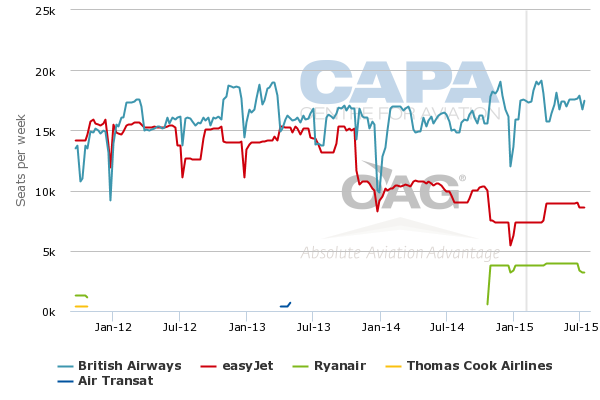 Both Ryanair and easyJet recently reported strong progress during the quarter ended Dec-2014. Both demonstrated that losses in the traditionally weak winter period are narrowing. Ryanair even looks set to report a profit for its winter half year and raised its guidance for FY2015 (March year end). Ryanair cautioned that high levels of fuel hedging would limit profit growth in FY2016, especially as it expects lower fuel costs to add to downward pressure on fares. easyJet too has fairly high levels of fuel hedging. Nevertheless, both look well positioned to take further market share from higher priced legacy carriers, building on initiatives around product and service quality and targeting business travellers (although they are at different stages in these areas). Where there is a marked contrast between Ryanair and easyJet is in average revenue per passenger. Ryanair's lower costs allow it to sustain lower fares profitably. For many years, the two have mainly attacked different markets, but head to head competition between them is on the increase. In this report, we analyse the extent of their overlap. Ryanair now expects net profit for FY2015, the year to Mar-2015, to be in the range EUR840 million to EUR850 million, implying year on year growth of at least 60%. Its previous guidance range was EUR810 million to EUR830 million. Given that its 9MFY2015 net profit was EUR844 million and its 3QFY2015 net profit was EUR49 million, it now seems highly likely that it will report a profit for every quarter of its fiscal year for the first time since FY2008. One of the most impressive features of its result this financial year has been the strong load factor gains (+6ppts to 88% for 3Q and +4ppts to 89% for 9M), while revenue per passenger has also grown (+3% for 3Q and 9M). Total revenues grew by 17% year on year in 3Q. In spite of its opening of new routes, which can dilute yields, it seems that the increased focus on customer service and on primary airports is paying off. Nevertheless, Ryanair expects 4Q average fares to be down by between 6% and 8%, partly reflecting strong traffic growth, expected to be up 25% as it grows the network and business schedules. The company also expects cost per passenger to fall (-5% for FY2015), helped by load factor gains and lower fuel prices on the unhedged portion of its fuel requirement. It has hedged 90% of FY2015 at prices equivalent to USD95 per barrel of Brent crude oil and 90% of FY2016 at USD92. easyJet does not report full results for its fiscal 1Q, but does give details of revenues and of the progress in cost per passenger. Its revenues grew by 4%, with passenger numbers up by a similar amount. Foreign exchange movements reduced the growth in revenue per seat to just 0.8%, but the increase would have been 3.8% at constant currency. This indicates a solid underlying pricing environment for easyJet, assisted by relatively controlled capacity growth (seat numbers were up 3%), initiatives on revenue management and digital channels and further growth in business passengers. Although not giving a target for its FY2015, the year to Sep-2015, easyJet said that it expected its 1HFY2015 pre-tax result to be a loss of between GBP10 million and GBP30 million. This compares with a pre-tax loss of GBP53 million in 1HFY2014 and would be easyJet's narrowest loss in absolute terms for 1H (coinciding with the winter season) since FY2007 and its best 1H pre-tax margin since it reported a small 1H profit in FY2002. easyJet has hedged 84% of its FY2015 fuel needs at USD936 per tonne and 63% of FY2016 at USD908 per tonne. Ryanair's 3QFY2015 results presentation highlighted the impact on easyJet of its entry onto London Stansted to Edinburgh and Glasgow at the start of winter 2014/2015. According to data presented by Ryanair, easyJet cut capacity on Stansted-Glasgow by 40% and on Stansted-Edinburgh by 15%. 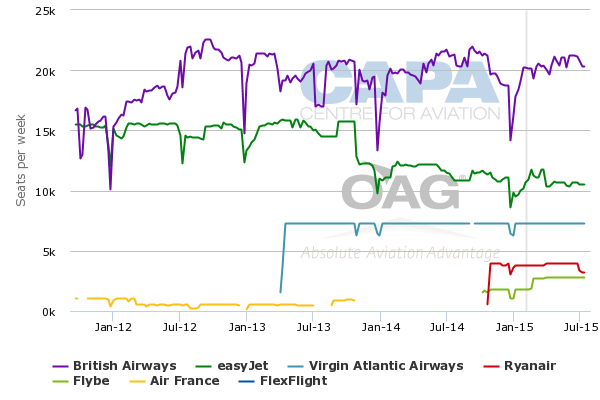 This is roughly consistent with OAG data for these airport pairs, where Ryanair now has more capacity than easyJet. Again according to Ryanair, easyJet's traffic numbers and load factors on both routes have suffered. Ryanair has achieved passenger numbers similar to, or above, easyJet's previous level and with respectable load factors. The data presented by Ryanair do not fully reflect the market from London to Glasgow and Edinburgh, taking account of other airports. easyJet remains roughly twice the size of Ryanair by number of seats between all London airports and Glasgow and well over twice its size on London-Edinburgh. Nevertheless, easyJet has reduced capacity overall in these city pair markets, even if the cut is a lesser percentage than on its Stansted services. easyJet has cut its overall London-Glasgow seat capacity by less than 30% and London-Edinburgh by around 10%. This leads us to examine the extent of competition between Ryanair and easyJet across their networks. According to OAG data for the week of 6-Apr-2015, Europe's two leading LCCs will overlap on 31 airport pairs at the start of the next summer season. This direct, head to head, competition between them represents only a small share of each network, although it is more significant to easyJet than it is to Ryanair. The overlapping airport pairs account for around 4% of total seats for both airlines, but, whereas they account for less than 3% of the total number of airport pairs in Ryanair's network, they represent more than 5% of easyJet's total number of airport pairs. Ryanair will have more seat capacity than easyJet on 25 of these 31 airport pairs. Moreover, Ryanair has been more active recently in starting up airport pair routes already operated by easyJet, with five launched in the 12 months from Mar-2014 to Mar-2015. In addition to its winter 2014/2015 launch of Stansted to Glasgow and Edinburgh, Ryanair commenced Stansted-Prague at the start of summer 2014 and will launch Luton-Copenhagen and Madrid-Berlin Schoenefeld at the start of summer 2015. The airport pairs on which the two already competed were mainly leisure routes. These five new ones are important to business travellers. By contrast, easyJet has rarely moved onto a Ryanair airport pair in recent years, with its Feb-2013 launch of Stansted-Marrakech being the only example since Sep-2011 (easyJet started to fly Edinburgh-Alicante as a year-round service from Apr-2012, but had previously been on the route in the summer season). Although airport to airport competition between Ryanair and easyJet is relatively rare, there are more examples of city pair competition. Although different airports have different catchment areas with different demand profiles, it is important to examine this wider perspective. City pair competition between the two airlines represents a greater proportion of both networks, particularly for easyJet. There will be 85 city pairs operated by both airlines at the start of the summer 2015 season (week of 6-Apr-2015, source: OAG). These overlapping city pair routes account for 16% of easyJet's total city pairs and 22% of its seat capacity. For Ryanair, the overlap represents 7% of its city pairs and 13% of its seat capacity. A significant number of these involve the four London airports that they serve between them (Stansted, Gatwick, Luton and Southend, the last of which is not served by Ryanair). There is also city pair overlap on routes where there is no direct airport pair competition between them, from cities such as Milan and Paris. For Milan, Ryanair only uses Milan Bergamo, whereas easyJet uses Malpensa and Linate. In Paris, it uses Beauvais and Vatry, where easyJet operates from the main airports of CDG and Orly. Again, Ryanair puts more capacity than easyJet on the majority of the city pairs where the two both compete, with more seats than easyJet on 51 of the 85 city pairs. Ryanair's impact on easyJet's traffic on the Stansted to Glasgow and Edinburgh routes is due to its lower fares. Ryanair's website displays very competitive rates for each of the five easyJet airport pair routes that it launched in the period Mar-2014 to Mar-2015. In every case, the lowest fare offered by Ryanair is less than the lowest fare of easyJet for travel in the week of 6-Apr-2015 (see table below), with discounts ranging from 31% to 59%. Of course, these fares are below the levels at which they may eventually stabilise, as Ryanair is promoting them aggressively. Nevertheless, Ryanair is Europe's lowest cost producer, as measured by cost per available seat kilometre (CASK), and is consistently able to offer lower fares than its competitors. Analysis of the financial results reported by both airlines shows that Ryanair has generated total revenue per passenger (including all ancillaries) that has been less than that of easyJet by between 22% and 33% over the past 10 years. In calendar 2014, ending with the quarterly results recently reported by both, Ryanair's average revenue per passenger was 27% below easyJet's (EUR63.6 versus EUR86.5). This discrepancy suggests that the Ryanair discount to easyJet's fares on the routes noted above will narrow. However, Ryanair should still be able to maintain significantly lower fares than easyJet across its network due to its lower unit costs. This is likely to remain the case even with any cost creep due to Ryanair's raised level of customer service and growing use of primary airports. As we have noted in a previous report, easyJet is ahead of Ryanair in terms of customer service initiatives and its primary airport network. Nevertheless, easyJet cannot afford to relax if direct airport pair competition with its larger rival continues to increase. But, as easyJet's management team has demonstrated over a number of years, it is more than capable of rising to a challenge.